1. 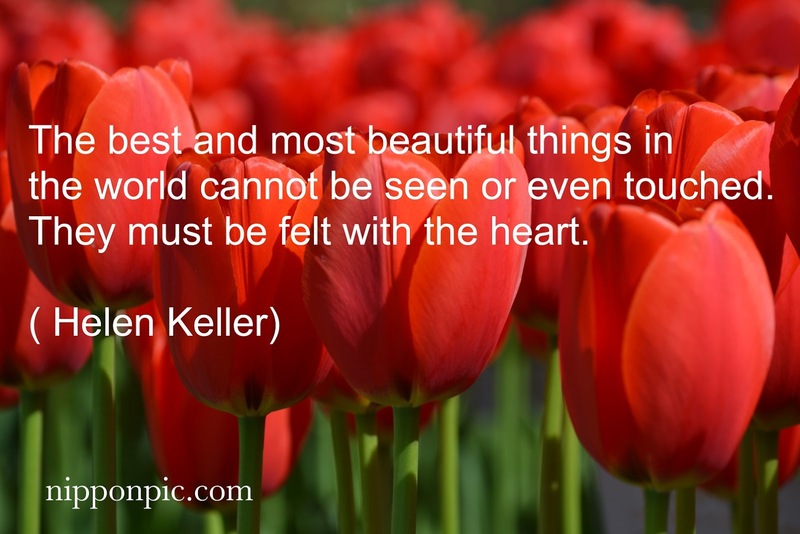 The best and most beautiful things in the world cannot be seen or even touched they must be felt with the heart. 2. Never bend your head.Hold it high,look the world straight in the eye. 3. The only thing worse than being blind is having sight but no vision. 4. Be happy with what you have,while working for what you want. 5. When one door of happiness closes,another opens,but often we look so long at the closed door,that we do not see the one that has been opened for us. 6. I'am only one,but still I am one.I cannot do everything,but still I can do something.I will not refuse to do something I can do. 7. Although the world is full of suffering,it is also full of the overcoming of it. 8. We could never learn to be brave and patient,if there were only joy in the world. 9. Keep your face to the sunshine and you cannot see the shadow. 10. Believe,when you are most unhappy,that there is something for you to do in the world.So long as you can sweeten another's pain,life is not in vain. 11. Walking with a friend in the dark is better than walking alone in the light. 12. Love is like a beautiful flower which I may not touch,but whose fragrance makes the garden a place of delight just the same. 13. Alone we can do so little.Together we can do so much. 14. Happiness cannot come from without,it must come from within. 15. So long as the memory of certain beloved friends lives in my heart,i shall say that life is good. 16. When we do the best that we can,we never know what miracle is wrought in our life,or in the life of another. 17. Life is succession of lessons which must be lived to be understood. 18. Better to be blind and see with your heart,than to have two good eyes and see nothing. 19. The simplest way to be happy is to do good. 20. What I'm looking for is not out there,it is in me.